Ottomans There are 139 products. 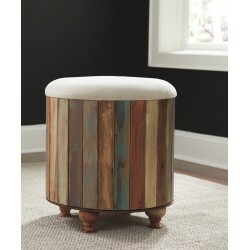 Small but mighty, this ottoman with storage can be a big help when you're tight on space. Flip top goes from a cushioned seat to a table surface/serving tray with cutout handles. Round design beautifully goes with the flow. Inspired by penthouse suite living, this designer ottoman in crimson faux leather is high-end style made comfortably affordable. Striking a pose with a clean, linear profile, this sumptuously upholstered ottoman sports minimalist-chic metal feet for an ultra-modern twist. This ottoman is far from plain. Charcoal gray upholstery is inspired by contemporary Euro leather with an embossed natural grain effect and matte finish. Light gray stitching adds contrast. And with a tufted top, this ottoman is in a league of its own. Divine design. This ottoman intertwines high-end style with a higher level of comfort for irresistible results. Its clean, contemporary profile is made all the more alluring with a richly neutral chenille upholstery teeming with texture. Chicly tailored and highly versatile, this ottoman brings an added element of form and function to your living space. Use it as an accompaniment to a chair, sofa or loveseat. Topped by a serving tray, it does wonders as a table surface, too. If you like the idea of a richly versatile transitional look that feels fresh and contemporary with a timeless classic sensibility feast your eyes on this chic ottoman. Its brick red "adobe" upholstery is a colorful change from the ordinary. Box cushioning gives this ottoman a clean, linear style, while tapered feet add a lovely softening effect. X-ceptionally stylish, this vibrantly upholstered ottoman with X base design has such cool crossover appeal. Thickly cushioned top is firm enough to serve as a casual coffee table when topped with a tray. Better yet, use it as a traditional ottoman and kick up your heels in comfort. While exuding a sense of upscale refinement, this ottoman keeps it real with nailhead trim accenting and a muted hue upholstery that feels natural and organic. Sumptuous and supportive top cushion makes it all too easy to kick up your heels in comfort. Destination: urban oasis. Elevate your design aesthetic with a chic look inspired by city high-rise living. Sleek, sultry and tailored to a T with plush yet structured cushioning packed with metro modern flair this ottoman is where sophisticated style meets everyday comfort.